The working principle of thermal power plant operation depends on Rankin Cycle. In a thermal power plant, coal is coming from coal storage and burnt in the boiler. It converts water into steam. This steam is expanded in the prime-mover (i.e. turbine) which produces mechanical power driving the alternator coupled to the turbine. The steam is expanded again the turbine and usually condensed in the condenser to be fed into the boiler. But in real practice, the conversion of heat from coal combustion into electrical energy needs some modern arrangements and improvements, in which it will run in proper working efficiency. 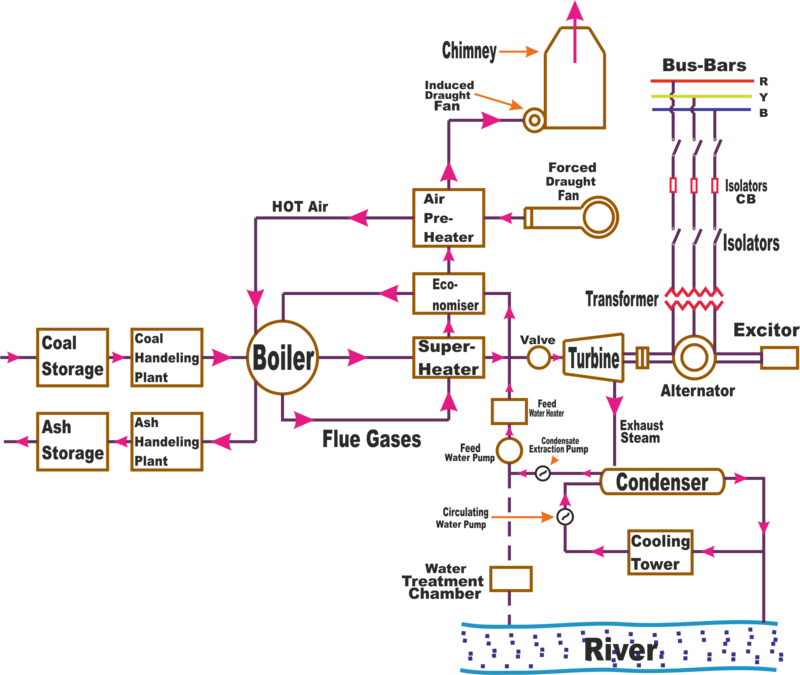 Here are some basic circuit arrangements of the modern thermal power plant operation. The thermal power plant consists of a boiler and other auxiliary equipment which is required to utilize the air and flue gases. In the above picture, it is seen that air is coming from the atmosphere by a forced or induced draught fan through the air pre-heater. In the air-preheater, air is heated by the heat of flue gases which passing to the chimney. This flue gases are passing through boiler, super heater, air per heater and finally exhausted to the atmosphere through the chimney. The boiler is an essential equipment of the thermal power plant operation. In the boiler, heat is produced by coal combustion, is utilised to convert water into steam at high pressure and temperature. The steam is the wet condition in the boiler and it is converted dry and superheated condition by the flue gases when it is passed through the superheater. Superheated steam means the steam temperature is above the boiling point of water and this will provide added advantages to the turbine. This steam is increased the overall efficiency of the turbine and protect the turbine's blade from corrosion. Economiser and air preheater are such type of devices which extract the heat from flue gases on their way to a chimney and increased the temperature of the feed water. Economiser is basically a feed water heater which recovers heat from flue gases and increase the temperature of the fed water before it is supplied to the boiler. Air is also supplied for the coal burning. Air preheater also extracts the heat from flue gases when it is passed in it. Air preheater increases the heat of air as well as improves the overall efficiency of the turbine. It also increases the steam capacity per square meter of boiler surface. Now this dry and superheated steam is fed to the blades of steam turbine through the main valve. Here steam energy is converted to the mechanical energy. Condensed steam is coming out of the turbine and the condensate is extracted from the condenser by the condensate extraction pump. Exhaust steam is passed through the low-pressure feed water heater where its temperature is raised by the bled steam. The feed water is now pumped by deaerator to high-pressure feed water heater where this feed water is heated by the heat from bled steam extracted at suitable point of steam turbine. Deaerator is to reduce dissolved oxygen content in the feed water. Feed water is pumped into the boiler the boiler and it is passing through the economiser where it is heated by the heat of flue gases. This will increase the overall efficiency. Some steam and water are lost when it is passed through the different component of the system. Turbine is directly coupled to the alternator which converts the mechanical energy of turbine into electrical energy and delivers the electrical output to the bus bar. Cooling water is supplied from a natural source of supply such as river, channel, sea, etc. This water is circulated through the condenser for condensing the steam. It will increase the overall efficiency of the plant. The circulating water absorbs heat from the exhaust steam and becomes hot. This hot water is coming out from the condenser and discharged at a suitable position like a lake, river etc. To ensure the availability of cold water throughout the year, a cooling tower is used. During the scarcity of water, hot water of condenser is passed to the cooling tower where it is cooled. The circulation of cooling water to the condenser is to maintain low pressure in the condenser.